F motor # 98944 and Remo cordless battery pack # 2262. This translates to the 1944th Motor ever made for the Nikon F, probable production late 1959 or early 1960. Early Nikon F's command a handsome premium. Are they really complete without an early motor?? Just as the F was the first very successful Pro 35mm SLR, the F motor was also the first successful battery driven electric 35mm SLR motor. The motor was a big part of the F's success, since it meant Nikon could do things its competitors couldn't. Strangely enough, the first self contained motor with the batteries directly attached was NOT a Nikon product, but rather independent American products, the Jacobson POWERCON and the REMOPAK and, both made in Los Angeles. Nikon copied their ideas to produce the F36 cordless battery pack!! Before that, Nikon F's used a separate battery pack designed to be worn on the photog's belt or shoulder, with a connecting cord between the pack and motor. It was carefully designed to strangle the photog at the most inopportune moments. The base was designed to give as wide as support as possible to the camera and lens, as well as to provide easy access to the opening key. The connection to the motor is actually superior to the later Nikon design, since it is one piece with the battery pack, providing a stronger connection than the easy to loose Nikon connector. The top of the Remopak slid away, to reveal 8 AA batteries. That little button to the left of the visible batteries is the front shutter release. The photog could also use the shutter release on the back of the motor drive. 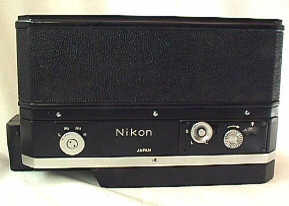 Originally Nikon did not make a battery pack which attached directly to the motor, a "cordless battery pack." Originally Nikon had a separate battery pack designed to be worn on the photog's belt, with a 3 foot connecting cord in between. Of course photogs wanted to get rid of the separate battery pack. The motor was introduced with the F in 1959. 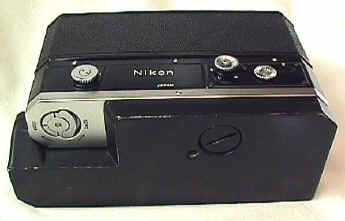 Nikon did not finally introduce their cordless battery pack until about 1968. Hello to American ingenuity, the Jacobson POWERCON and the REMOPAK cordless Nikon F battery packs. 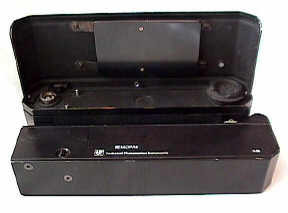 Irving Jacobson originally patented the Jacobson POWERCON, about 1963 per his son Mark Jacobson, who is also in the Photographic business. They were made in the heart of Hollywood on famous Vine Street. 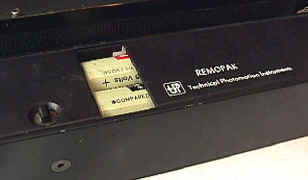 Several years later the REMOPAK was actually designed as a less expensive POWERCON, with royalties paid to Jacobson. Behind the REMOPAK were Laurence Schiller and JR Eyrman, famous LIFE photographer known for his unusual and hard to duplicate pictures. Many of Eyrman's unusual shots were done with special cameras or accessories made to Eyrman's specs by Jacobson. Both designs got rid of that separate pack by attaching a battery pack to the motor. Eventually Nikon got the picture, making their own cordless battery pack, essentially obsolescing the products Nikon imitated. Exact production of these monuments to American capitalism is unknown, but Mark estimates only about a 1000 Nikon F POWERCONs were made, and only 12 for the Nikon SP Motor. He is unsure of REMOPAK production. But since REMOPAKs are harder to find, it seems a safe bet less REMOPAKs were produced. Though this Remo has number 2262, the numbering may easily have started at 2,000 since I have yet to find one with an earlier number. If you have one, I would be appreciate being emailed the serial #. Sharp eyed Leica collectors might have taken extra notice to the name of "Remo." The REMOPAK has a famous rich cousin, the Norman Goldberg designed REMODRIVE. You might know it by its later name, after Leica bought it, the fabled Leica M Motordrive for the M2 and M4. 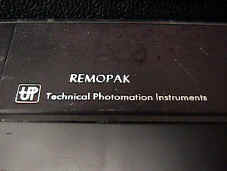 The REMOPAK and REMODRIVE were produced by TPI, Technical Photomation Instruments of Los Angeles. Every time you pick up your new F5 or N90s with its self contained motordrive batteries, remember to thank the Jacobson POWERCON and the TPI REMOPAK. Without them, Nikon might still be making a separate battery pack to wear on your belt! !